im in maryland is gas is down to $2.39. that has happened to me at my library also!! i saw that it wasnt checked in but KNEW i had returned it. i happened to go over to the shelf to see if it was there and it was so i took it to the counter and told them about it. such a pain when that happens. I am surprised at the whole library debacle. I would think a library in a smaller town would have less traffic and thus more time for the staff to pay attention to each task. Maybe the computer systems is buggy. I've had that same library book situation happen to me with our local library, twice! The first time, I did like you and found the book myself, ON THE SHELF. I love that hat. 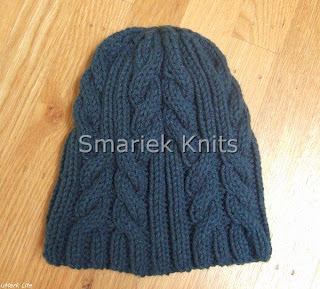 I really do need to knit a cabled hat, as I've not done one yet. Our gas is $2.19 at present. Gas is anywhere from 2.199 a gallon to 1.929 a gallon here. My brother saw gas for 1.689 a gallon in the Kansas City, Missouri area. I really had enjoyed making this hat of yours, I made it awhile back for someone who was going thru chemo, I knitted in a cashmere/merino blend, and it was one of her favorites. The library story made me giggle a bit. Hope the book turns up somewhere. Thanks for reminding me to return mine tomorrow:) That's a great hat. That hat looks great. I'm so impressed that you could go down so many rows and fix it - I don't think I could do that! I got gas on Sunday at the corner of Remington and Sunnyvale/Saratoga for $2.73 per gallon! Check it out. That is annoying when the books don't scan in. Speaking from the other side of the circulation desk, it's probably more likely in a small library, where the worker (a/k/a me) is often trying to juggle four or five things at once. Doesn't excuse it happening, but may go some way to explaining it. With our computer system, if someone else tried to check it out, we would get a flag that it is "already checked out to..." Then we would check it in and reverse any accrued fines before sending it out again. Love, love your utopia! I think I may have to make another one (my 3rd!). I've had the library thing happen to me too! Same thing! I found it on the shelf! Very fustrating. Oh, try funbrain.com. My kids like it and I think there might be stuff there for younger ones as well! Take care. They use the free stuff, I've never checked out the "premium" stuff that you have to pay to join. I recently had the library thing happen to me to up here in WA. I never got as far as looking for the book though I just called them and they said "oh I wonder how that happened!" Now I always check online to make sure my returned books are checked back in. Thanks for all the cable scarf patterns - yours are the only scarfs I make! Have a great Thanksgiving!